We have all heard it but what does it mean? Raising your metabolism. 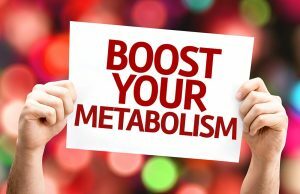 Before you can do something about the extra pounds to shed, understand what metabolism means. Metabolism is the sum of all the reactions that occur in the body. When we are young and growing our metabolism is high. The body is working overtime to provide calories for tissue to develop. Once we reach full maturity, the process starts to reverse. It is only a little at first but then becomes an avalanche the older we get. Why is this? The reason is several fold. First, we are breaking down faster than we are building up which is called aging. Secondly internal burning from our hormones are decreasing. Lastly, and most important, we are consuming more calories than we are burning. One pound of fat equals 3500 calories. The average adult American gains and extra 5 pounds per year. That equals 17,500 more calories that we take in that we don’t burn. So how do we lose that? The answer is a little tricky. We cannot just decrease our calories down to 1,000 per day. Besides feeling tired from no energy (and cranky) the body responds by lowering the metabolism to meet the intake. The best combination is a mixture of decreasing calories and increasing exercise. Trying to burn an extra 500 calories per day would technically make you lose 1 pound of fat. The exercise must be a combination of cardiovascular which is a continuous exercise for a period of time, along with some type of weight training. We make all kinds of excuses about not having enough time to exercise, to saying that “I am not a gym person”. Here is the answer. Think about it, the average American watches 3 hours of TV daily. During your favorite TV show, ride a stationary bike, put some weights in the living room or wherever you sit and exercise. It doesn’t have to be hard, just consistent. In a few short weeks you will develop the habit of exercising and raise your metabolism!